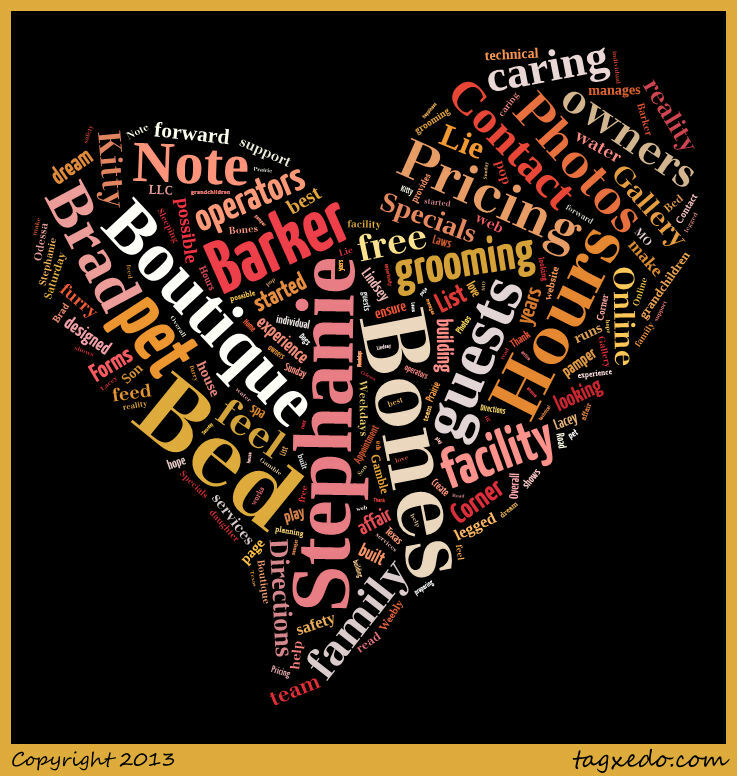 Bed & Bones started as just a dream and has become our reality! After several years of preparing, planning, and building we are looking forward to caring for your pet! Bed & Bones is a family affair! Everyone works as a team to give our guests the best experience possible! Brad designed and built our entire facility, and together, we as owners and operators do all that we can to make each guest feel like a part of our family. We both feed, water, pamper and play with our furry four legged guests and ensure their safety, happiness, and well being. Our daughter Lindsey runs our in house pet spa and provides all grooming services at Bed & Bones. Our daughter Lacey provides technical support and manages our web page. Our Son-In-Laws and our 8 grandchildren pop in and help out as well. Overall, we love what we do and we hope that it shows! Thank you so much for the opportunity to care for your pet! ​Boarding check-out time is 2:00 p.m.